The landscape makes a stark impression as we arrive from a long drive through northwestern Colorado. 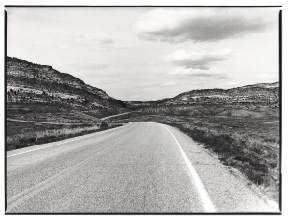 State Route 318 is a lonely road, where first you lose the radio signal, then, entering Utah, the pavement, and last, as you twist on muddy trails through fields of natural gas pipelines, bone-dry washes, and Cretaceous Dakota formations, you lose your sense of direction. We eventually find Highway 191, turn south, and catch our first glimpse of the Uintah Mountains, covered in dark, green blankets of lodgepole, pinyon, and ponderosa pine. It is hard not to be moved by the beauty that stands before us, out here in the middle of nowhere. The landscape is jagged contrasts of red sandstone desert, juniper-lined hills, and the Flaming Gorge Reservoir, a vast expanse of sapphire water. Considering where we had been, and where we thought we were going, we feel as if we have stumbled upon a misplaced oasis. We drive down to the base of the 500-foot Flaming Gorge Dam to sneak a peek at the Green River. The clear water is a welcome sight. For Colorado fishermen, May is the cruelest month, when the mountains purge snow pack, turning freestones chocolate brown, making wading an adventure only for the brave and obsessed, and fishing utterly hopeless. 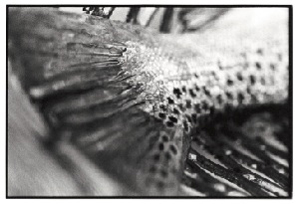 We make out dozens of fish in the shallows, flashing their sides like dirty metal as they feed. Hundreds and hundreds of cliff swallows eat insects back and forth across the water. The late-afternoon light gathers on the far wall of Red Canyon, then spreads back over the surface of the river like a fire flickering out. It is becoming clearer why Denny Breer sunk his tent stakes by the Green nearly 15 years ago. We get back on 191 and head north for the Wyoming State line. Earlier in the year, Denny suggested we stay at the Spring Creek Ranch near Minnie’s Gap. We make a right turn onto a long, dirt driveway, just past Clay Basin Road, and rumble toward the main house and guest quarters. We are met by a greeting party of bell-collared goats, picking at spring grass under the wooden porch. Spring Creek Ranch lies amidst the low-rising fields of bunchgrass and tumbleweed in southwestern Wyoming, where eroded gullies and breaks give way to miles of open rangeland and the northern high plains. The ranch encompasses 560 deeded acres with a controlling access to another 48,000 acres (75 square miles) of open-to-grazing federal land. A converted bunkhouse features spot-clean rooms named after legendary cowboys, two restrooms with showers, a single payphone, and nothing else but unspoiled views. Our hosts cook eggs, hash browns, and pancakes to order every morning at seven. We tell them we are here to fish with Denny Breer. The next morning, we arrive in Dutch John to watch Denny send out his fleet. He has a cadre of seasonal guides working for his business, Trout Creek Flies, most with at least 10 years of experience on the Green. He greets his guides every morning with a smile, then briefs them on river conditions, weather, and the skill level of their clients. We decide to head for the river after the chaos subsides, but there is one complicating factor. Over the weekend, Denny burned out the clutch on his old, white Suburban, after rolling mile 300,000 on the odometer, and he is waiting for a part to be driven in from Vernal. So we hook his drift boat to the 2-inch ball hitch on our truck and head for the river. Denny suggests a crack at the A section. He knows everyone at the boat ramp, including guides, long-time fishermen, and Forest Service officials. 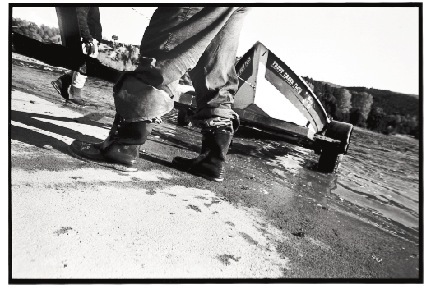 As we slide into our waders, he dons a pair of shin-high Wellington rubber boots, then climbs into the dory and has one of us turn the craft into the current where he can take control with the oars. We never ask, but it seems Denny has a goal of having his anglers laughing within the first half-mile. We start casting large Royal Trudes into a series of giant eddies, and soon hear an odd kissing noise coming from the center of the boat. It is Denny, puckering like a fish, calling or “salting” his little friends. “Here fishy, fishy, fishy. Here, fishy, fishy, fishy,” he calls. Denny likes to encourage the trout to eat at the start of each day. When “playing nice” with the Green River’s trout does not work, he turns to humiliation, which usually gets the job done. 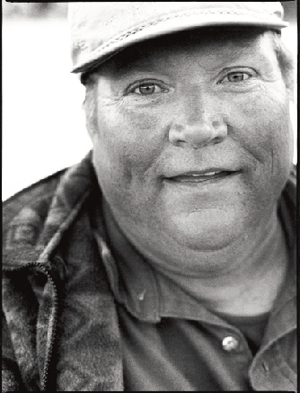 On the water, it is not hard to sense that Denny is a respected figure among local rivermen. 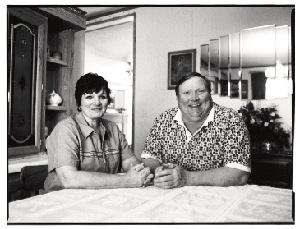 He explains that Dutch John is a close-knit community, primarily because Daggett County, which encompasses the Flaming Gorge region, is home to only 700 or so full- time residents. They depend on each other during the winter for transportation and emergencies, and in the summer when “bootlegger” fishing guides and an onslaught of 1.5 million tourists pass through the area. They also have had to become allies in the face of threats to this remarkable fishery. Endangered fish studies by the U.S. 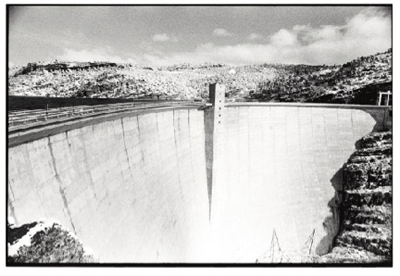 Fish and Wildlife Service and the Bureau of Reclamation (who originally dammed the river) have dramatically altered flow regimes from the dam in an effort to recreate “historic river flows,” and in hopes of reestablishing habitat for Colorado River pikeminnows, razorback suckers, bonytail chubs, and humpback chubs. Although the new flows as yet have not had a dramatic negative impact on the trout fishery, they have not been a panacea for the endangered species either. Near the Merry-Go-Round run we notice the unmistakable, canary- yellow dory of one of Denny’s close friends, Emmett Heath, “The Dean of The Green.” Denny says it is great to see him back on the river. A few years back, Emmett was preparing to launch at the dam when his customers took notice of his pale and sickly complexion. It turned out the clients were both cardiologists, and Emmett was in the early stages of a heart attack. He immediately was airlifted from the boat ramp straight to an intensive care unit in Salt Lake City. He was lucky to have had two fly-fishing doctors and his friends looking after him. By all accounts, if Emmett had launched into Red Canyon that morning, he probably would have died. On frequent supply runs to Salt Lake City, Denny would visit Emmett in the hospital, before and after the heart transplant. Denny Breer was born and raised in Salina, Kansas. His grandfather, who worked for the Santa Fe-La Junta Railroad in Colorado, introduced him to fly fishing. They spent many vacations together, exploring different regions in the southern Rockies and poking around on rivers like the Conejos, Arkansas, and Rio Grande. These early trips sparked a lifelong passion in Denny, one that would lead him throughout North America, to the far reaches of Alaska and eventually, back to the Green. He is grateful to his granddad for this gift. Denny was an Army draftsman during the Vietnam War. He fashioned military maps of Danang, Ben Hoa, and the City of Saigon. 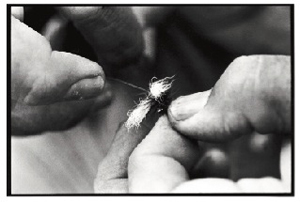 You can still see his meticulous attention to detail when rowing, tying flies, or working a run. 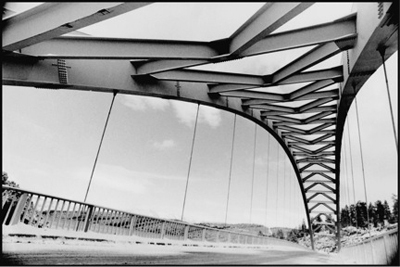 After the service he returned to Colorado and worked various surveying, construction, and civil engineering jobs during the seventies and eighties. It was during this period that Denny started rowing dories, and discovering some of the West’s legendary trout waters. It was also around this time that Denny’s mother set him up on a blind date. He and Grace hit it off on the first night, moved to the Green, established Trout Creek Flies two years later, and never looked back. Denny cut his guiding teeth in Alaska. In the early eighties, he saved up enough money to take an “ultimate fly-fishing trip” of his own and was so enamored with the raw and unspoiled character of the Far North that he vowed to return as often as he could. Figuring he would go broke if he had to pay for every adventure, and having enough confidence in his own river skills, he hired on as a guide with Wayne Dawson’s Headwaters Expeditions. He spent the next several summers working the Kuskokwim drainage, specifically the Aniak River, some 350 air miles west of Anchorage. It was an experience that put Denny on the map as far as guides go, especially after he hosted televised angler Jerry McKinnis of The Fishin’ Hole. What Denny values most about Alaska is the hard-earned education he brought home with him every fall. He says you usually can tell which fly-fishing guides in the Lower 48 are graduates of Alaska, because there is not much that can faze those guys. They have seen it all by way of weather, critters, fish, and clients. Denny laughs when he describes many of his own Alaskan experiences, especially a trip with a sweet-tempered southern woman and her remarkably heavy gear bag. He had moved her dry-bag, which weighed nearly 100 pounds, at least a half- dozen times, on and off planes, to the boat and back, and was beginning to wonder what possibly could weigh so much. The Green is indeed a remarkable river, a chameleon waterway that changes its identity as fast as it flows, transitioning from the A to the more elusive B and C sections. What makes this river particularly engaging is the diversity of its insect life. There are typical tailwater staples like midges, scuds, aquatic worms, and craneflies, four different mayflies that have evolved and adapted (after the dam) from 37 former species, and a smattering of caddisflies and golden stoneflies. The Green’s trademark, though, is the May-through-October-long presence of terrestrials: big, poor-flying bugs like beetles, cicadas, grasshoppers, and Mormon crickets that roam the banks and eventually make their way into the river. 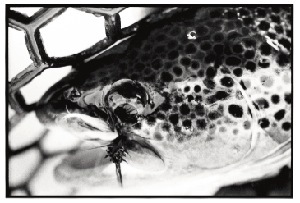 “There is nothing like the experience of watching a big trout slowly eat a cicada or big cricket off the surface. Sometimes, it seems like they take all morning to eat just one bug. It can be a challenge, but there’s not another river I’ve seen that lets you catch as many decent fish on really big and fun bugs like the Green,” says Denny. As the day heats up, so does the insect activity. Hundreds of swallows and flycatchers dart around high above, eating tiny, nearly invisible mayflies and midges. Denny pulls down a branch overhanging the river to show us what the trout really like to eat—dozens of freshly emerged cicadas. The nymphs live in the roots of trees, and then wander up the limbs as adults after they hatch, calling for mates and sunning themselves. Denny gets a big smile on his face, witnessing their arrival. “So, do you want to fish some cicadas, or stick with the nimp?” Denny asks. We decide on French fries and tie on purple-tinseled cicadas. The first cast prompts a strike from a very small rainbow. Denny mocks the angler with sarcastic instructions. “Come on, goose him a little, control that fish.” He uses his net like a ladle to scoop the fish toward his lap where he quickly springs the fly loose and slips the trout overboard. After driving back from Little Hole, Denny asks us to come around to his backyard because he would like to show us something. He turns to face us, and we notice he is holding a small pigeon in his hands. “I want to introduce you to my friends,” he beams. It turns out that this is no ordinary bird; it is a racing pigeon. Denny built a loft behind the garage two years ago, fulfilling a promise he had made to himself long before. Denny first grew interested in birds when he was eight years old, nursing to health a young swab, Speedy (named after the Ray Stevens’ song), that had fallen from a tree. He raised fancy birds off and on throughout his youth, but once he joined the service, he had to give his loft away. He vowed that if he ever sunk roots in one place deep enough, and had a house of his own, he was going to get back in the racing business. 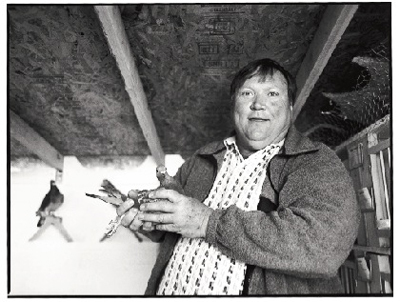 In 1998, when the government “privatized” Dutch John, Denny and Grace purchased a home a few streets down from “Guide’s Row.” It has more room and a yard big enough to raise birds. Denny’s birds are pedigreed back to the great racing lofts of Belgium. He is a fairly serious competitor and a member of a racing club in Vernal. 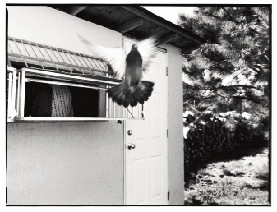 Competitions involve taking the birds to a release point, sometimes many miles away, and timing how long it takes the pigeons, some inspired by feed, others by the absence of their mate, to make the flight home. His “athletes” have brought home the prize more than once. Still, he says, competition is a secondary interest. He would own birds whether he raced them or not. What he truly enjoys is releasing them, watching them gather each other in formation, then dive and sweep above the roofs of Dutch John. It is hard not to notice the strength, size, and dexterity of Denny’s hands. Calloused, nicked, and scarred, they are a contrast of power and gentleness, an apt reflection of Denny himself. It is ironic that these same fingers, capable of pinching on chunks of split shot without the aid of pliers, tenderly gather nesting pigeons, pluck cicadas from riverside branches, etch detailed maps, and tie thousands of intricate fly patterns every year. On our second day, Denny drops anchor near Grasshopper Island and quietly sets the oars aside to thread a Royal Coachman onto a strand of 5X-tippet. Though red and chapped by a strong west wind, his hands remain fluid and steady, tying and retying lengths of line, moving boxes of tackle and anchor line, and brushing out the stiff hackle of an old dry fly. Once the fly is cinched tight, he tosses it over the side, lifts anchor, and takes hold of the oars. He warns us to lock in for a bumpy ride. We are sliding toward Red Creek Rapids, where a series of medium-to-large rollers and a gauntlet of exposed rock will test Denny’s rowing and navigating skills. He is not worried, just cautious. Over 2,000 days on this river give him the confidence to keep laughing and spotting fish, even when the dory starts to pitch. Denny negotiates high water the same way he handles most challenges on the Green, with poise, efficiency, and a bit of bravado. He says the trick is having the boat lined up correctly at the head of a rapid, and committing to a chosen line with confidence. 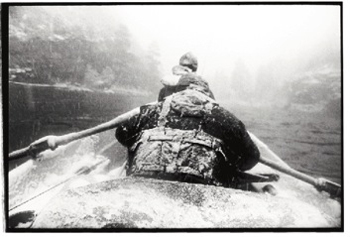 You want to be “steering” when running white water, not “rowing,” and too much of either often gets an oarsman into trouble. The river should do most of the work. Water crashes over the bow, slapping the knee-locked fisherman across the chest. He turns his head to avoid the next frozen wave, and in doing so, catches a glimpse of Denny, broadly grinning, leaning slightly toward the left gunwale to follow the line. Denny’s hands work short, succinct correcting motions on the oars, like tiny rabbit punches, first right, then left, then right again. We slip three yards wide of “The Dragon’s Tooth,” then the boat settles down through the tail out, just as Denny had planned. Spotting a slack pool near the bank, the angler at the stern shoots a “what-the-hell” cast into a foamy pocket, and a decent-sized brown gulps down the dry fly in a split second. The reel screams as the boat continues to barrel downstream, the fish holding its position. Denny steers toward an eddy where the fisherman can recollect his line and the fish. “We call that move a ‘drive-by shooting,’” Denny laughs. Just before lunch on our final day, Denny says we are in the home stretch, and that it is time to buckle down and catch Mr. Big. He has planned to stop at the John Jarvie Ranch, a preserved homestead by the river where Butch Cassidy and the Wild Bunch used to hide out, but right now the focus is on a 20-inch brown, not Western history. Denny reaches for his “special sauce” and liberally sprays a large, black Chernobyl Ant with his home-brew floatant. We let the pattern drift for a good thirty seconds, and then shoot again. The dark bug swirls around a rock and onto a shallow ribbon of current, no more than 8-inches deep. We do not want to move the fly, per Denny’s instructions, but figure that this bony water might provide a good opportunity to sneak a swig of Gatorade, or untangle a mess. Which, of course, sends a signal to a 22-inch brown trout that the time is right to wolf down the helpless fly. Which is exactly what happens. The fish thrashes violently as he speeds toward deeper water, running toward the boat, forcing one of us to gather yards of slack line with quick, saltwater strips. It takes three or four minutes to tire and net the monster. As Liz clicks photographs, Denny offers a theory. The next morning, Denny meets us early to sign copies of his book and to submit to a few, last-second portraits. He says he enjoyed having us, and hoped the Green looked a little different on the second go around; he certainly thinks it did. If Liz would be kind enough to pick her favorite photograph of Grace and him, he would love to have a copy, whenever she gets the chance. He knows Grace would appreciate it. Denny wishes us a safe drive, good luck with the book, and says we are always welcome back when we can find the time. It is fair to say that you may never meet a more genuine or thoughtful human being than Denny Breer. He is a rare and unselfish person who seems to care more about people than rivers, dams, or fish. There is no one quite like him. We hit pavement again when we cross the Colorado State line near Brown’s Park. Although we already miss Denny’s smile and laughter, it is a good feeling to be heading home. The radio picks up a weak signal from Craig, filling us in on the world and what we have missed in the past three days. By the time we make the small town of Edwards on the outskirts of Vail, nearly five hours later, Dutch John and the Green River seem remote, stubbornly surviving a world away. Like many who fish with Denny, we have been released to reconnect with work and family, traffic and travel, and the endless cycle of daily life. But sooner or later, we will return to the roost in Dutch John, looking for giant cicadas, windy afternoons, and a river full of greedy trout. Denny Breer knows that. On our first trip to the Green River the four-hour drive to Dutch John ends up taking seven because of a late- October snowstorm. 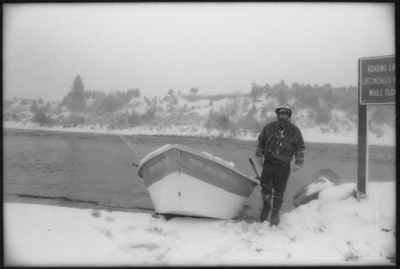 By the time Denny meets us at the Flaming Gorge Lodge to discuss the fishing plan for the next few days, it is 9 p.m. and bordering on a blizzard. Denny, who has the magnificent ability to find humor in almost every situation, wants to know why Liz, the non-fishing photographer, has brought all this awful weather and can she make it go away. For the next three days, however, no one will be able to stop this enormous fall storm, one that will leave a foot-and-a-half of snow on the banks of the Green River and much more throughout the rest of the southern Rockies. Snowstorm or not, we decide to float the Green River’s popular A section in the morning and take our chances with the fishing and the weather. Denny urges us to pick up extra hats, gloves, and spare raincoats at the lodge’s general store and to pray for a barometric shift. We’ll load up the boat tomorrow and give it a try, Denny says laughing, what happens on the river is out of our hands. When we wake, the Uintah Mountains are snowed-in and silent, the skies clear and cold. If this weather can just hold and maybe warm things up a bit, Denny says at the put-in, we might get some bigger fish up to the dinner table. Although the good-sized browns, rainbows, and cutthroats of the Green River routinely feed below the surface and always can be taken on nymphs, Denny prefers bright skies, warm afternoons, and terrestrials roaming the banks to reveal the Green River’s remarkable dry fly-fishing opportunities. Until lunch, the day is mostly uneventful as we cover about three miles of river with large green- tinseled Wulffs, cicadas, crickets, and find the fish in a “window shopping”mood. Without warning, the temperature plummets 15 degrees in an hour, thick gray clouds and sheets of snow move in, and the afternoon quickly turns to hell. It is only a matter of time before all of Liz’s cameras and their batteries freeze up and die, the fish go nuts—wolfing down any cicada in sight—and the waves of sideways snow force us to make a break for Little Hole. Three-and-a-half hours and a dozen large brown trout later, we beach the boat at the ramp, frozen to the bone, covered in a foot of snow, and slightly stunned by the day’s events. The storm never really lets up, making fishing, rowing, and photography nearly impossible, so we decide to cut our first trip short and return to the Green the following spring. 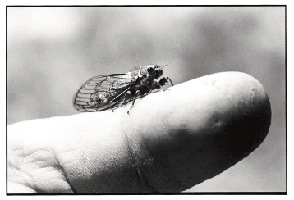 When we return, it is late May and weeks of warm weather have jump-started the annual cicada emergence from the floor of the Green River’s Precambrian canyon. Excellent numbers of cicadas and blustery afternoon breezes move many of the browns and rainbows from their deep-winter holding areas to the river edges and back-eddies. We spend a quiet couple of days floating both the A section (Flaming Gorge Dam to Little Hole) and B section (Little Hole to Brown’s Park), working every inch of bank with giant black cicadas and caddis flies. The brown trout of the lower river, often holding invisibly in just inches of gravel-bottomed water, are as ill-tempered and electric as any we have encountered. Like the lower sections of many famous tailwaters, Little Hole to Brown’s Park often is devoid of people, washes out quickly at Red Creek, and offers miles of rugged, desolate terrain with fewer, but smarter fish. Eating lunch at the historic John Jarvie Ranch, Denny says looking around, I’m sure we’re the only people who’ll fish here today—in this day and age, that’s kind of hard to believe. Tip: When float-fishing the Green with large terrestrials and cicadas, Denny urges, sometimes demands, his clients to leave their flies on the water as long as possible without readjusting or recasting. Over time, Green River trout have trained themselves to avoid fly patterns (especially those of poor-flying cicadas) that do not remain undisturbed on the water for longer than 25 to 30 seconds. For the trout, it is simply a means of survival. In their minds, big bugs that move unnaturally or too often are fraudulent and never worth eating. I don’t care how pretty the fly is, says Denny, if you move it all the time, they’ll know it’s a fake. 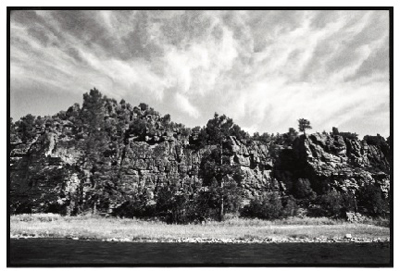 Excerpted from Castwork: Reflections of Fly Fishing Guides and the American West. Willow Creek Press, May 2002, 208 pages.